The Golan Heights span an area of 780 square miles, bordered by Mount Hermon in the north, the Yarmouk River in the south, the Jordan River and the Sea of Galilee in the west, Wadi Ruqqad in the east, and the Hauran region in the southeast. 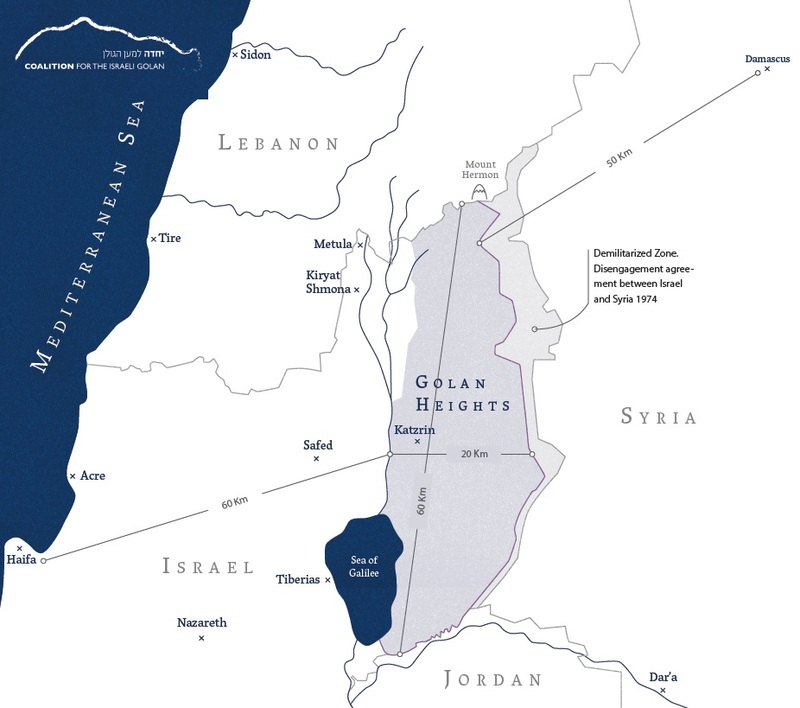 In December 1981, the Knesset ratified the Golan Heights Law, which extended Israeli rule of law to the Golan Heights and de facto annexed it to the State of Israel. 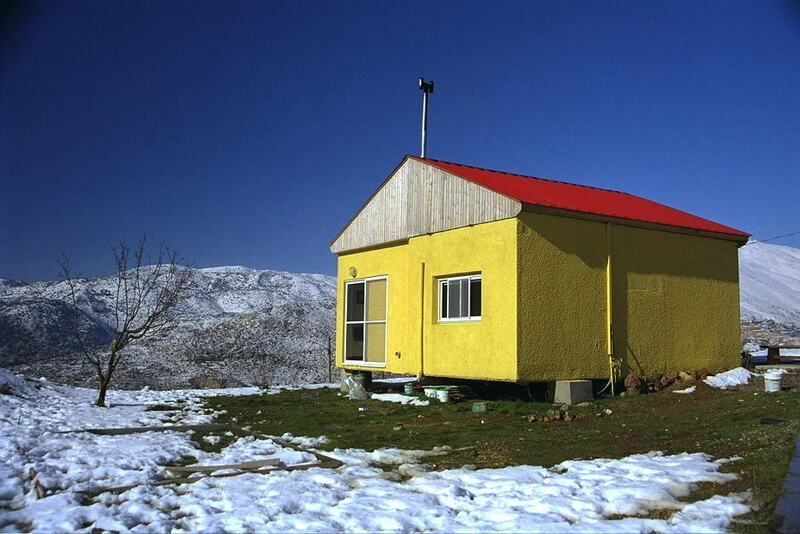 Prior to its enactment, there were 28 rural communities in the Golan Heights and a city in the making, Katzrin. After 14 years of Israeli control over the Golan Heights, the Jewish population in the Golan totalled about 5,700 people. According to data from the Israeli Central Bureau of Statistics, during the decade after the enactment of the Golan Heights Law in 1981, the number of Jewish residents increased by only about 5,000, nearly identical to the increase in the number of residents during the decade prior to the enactment of the law. 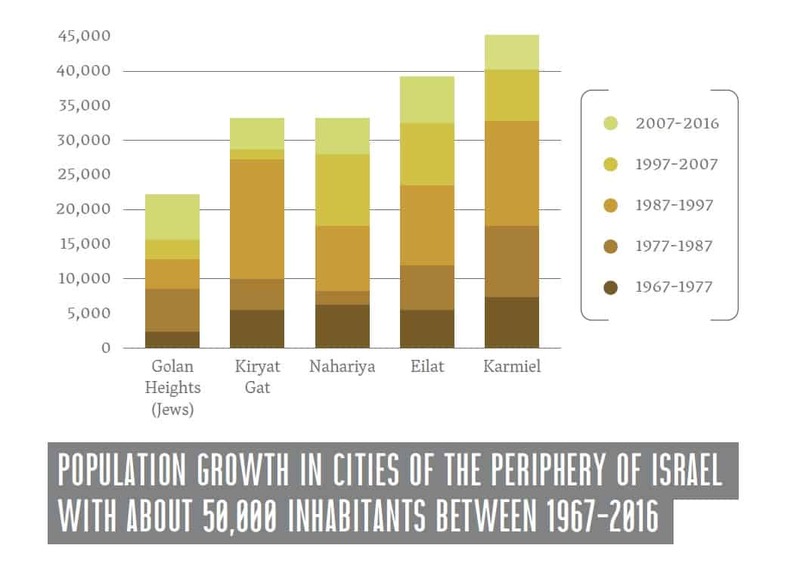 The pace of growth of Jewish communities in the Golan during the subsequent decades depicts a gloomy picture: during the twenty years between 1994 and 2014, the number of Jewish residents in the Golan increased by only about 7,000 people – in other words, the demographic growth in the Golan Heights essentially stagnated, apart from growth that reflects the natural growth rate of the existing Golan population. 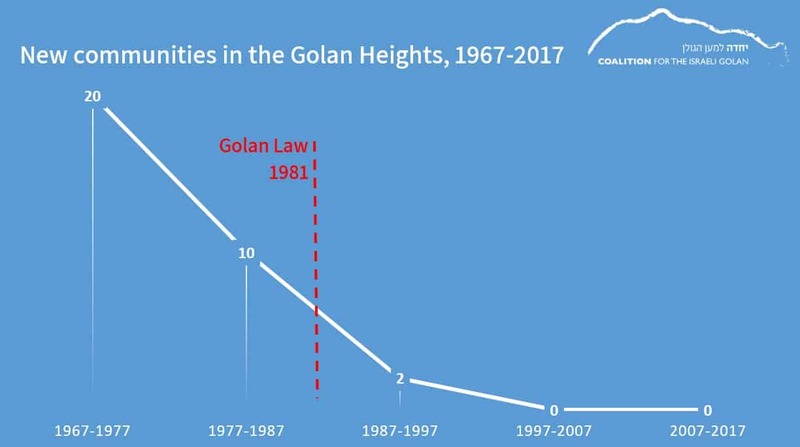 Since the enactment of the Golan Heights Law 35 years ago, only four additional communities have been established in the Golan. During the two decades between 1994 and 2014, while the Jewish population in the Golan Heights increased by about 7,000 people, the non-Jewish population increased by about 11,000 people. Correct to 2016, there are about 50,000 residents in the Golan Heights, comprised of about 22,000 Jews and about 27,000 non-Jews. For the sake of comparison, after fifty years of Israeli control over Judea and Samaria, the number of Jewish residents in this region exceeded 400,000 (over an area that is four times larger than the Golan Heights) – while the number of Jews who settled in the Golan Heights reached less than 5% of the number of Jews who settled in Judea and Samaria. In a region under dispute, in which Israel has a strategic interest in strengthening its presence, Israeli governments succeeded in settling – over a period of about half a century – only about 22,000 people. This statistic attests to meagre capability in carrying out national strategic objectives and to a persistent historic failure. In addition to slow development of the rural regions of the Golan, Israel’s governments failed to take action towards significant development of the urban regions, as part of Israel’s basic strategy of expanding the dispersion of the Israeli population and promoting its geopolitical and security interests in the Golan Heights. Had they been taking action towards achieving these strategic interests, Israel should have set a demographic target of about 100,000 Jewish residents in the Golan; it would have been advisable to achieve this target through the development of infrastructures – in both the rural and urban regions of the Golan Heights; it would have been advisable to analyze possibilities of establishing additional urban centers in the Golan besides Katzrin – a city that was itself neglected for many years, without Israel’s national planning institutions taking action to transform it into a major urban hub.